In this paper, the core research question“to what extent fashion industry can be sustainable” framed and reasoned based on three sub-questions: 1) How to define “sustainability” in the sector of fast fashion industry? 2) What are the institutional factors that intensify expansion of global fast fashion industry? 3) To what extent can “sustainable fashion” reverse the trend of fast fashion expansion? 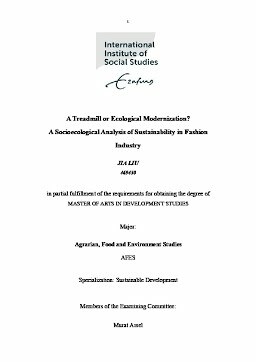 Two approaches of sustainable development, Treadmill of Production and Ecological Modernization are compared in their validity and applied as theoretical framework to analyze sustainable development in fashion industry with a political economic perspective. By defining sustainability, an evaluation frame is expected to be established to assess the efficiency of each approach. Both treadmill of production and ecological modernization theories analyze the relation between modernity and environment but differs from each other in several aspects like institutional structure: industrial production vs. capitalism; major driving force: economic growth vs. technological development; predicted effectiveness of ecological preservation etc. Combined with the characteristics of fashion industry and contemporary political economic condition, the analysis on fashion industry is re-framed in the paper. The analysis is focused on two key sustainable attempts in fashion industry: sustainable innovation in fast fashion industry and emergence of sustainable fashion brands. The analysis structure is based on the assumption that emergence of sustainable fashion is an innovative attempt under fast fashion system instead of a replacement of fast fashion. The conclusion is that fashion industry demonstrates more inclination to be an accumulated treadmill in terms of the dominant fast fashion production pattern and incomparable power of few fast fashion multinational corporations. Also, the fact that “sustainable fashion” is a business strategy instead of an environmentalism implementation means that sustainable fashion brands are not all committed to sustainability as they claimed. But we can not simply draw a conclusion that fashion industry perfectly exemplifies treadmill of production because whether the outcome of environmental degradation and natural resource extraction is not certain. More importantly, being environmental damaging and intensive in natural resource extraction is not the only standard to assess sustainability, but more about whether economic growth can pay off environmental and social costs and whether the sustainability achieved can sustain, or at least not sacrifice the next generation.